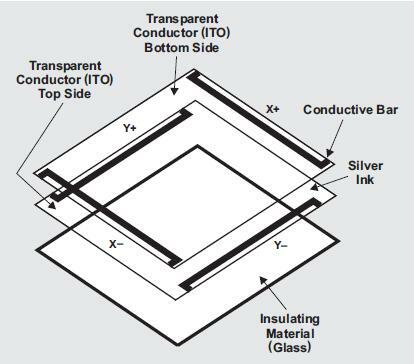 Resistive touch sensors consist of several panels coated with a metallic film, such as ITO (indium tin oxide), which is a transparent and electrically conductive. Thin spacer dots separate the panels from each other. When something, such as a finger (gloved or bare) or a stylus presses on the layers, it causes the two panels to make contact and closes an electrical circuit so that a controller can detect and calculate where the pressure is being applied to the panels. The controller can communicate the position of the pressure point as a coordinate to the application software. Because the touch sensor relies on pressure on its surface to measure a touch, a user can use any object to make the contact; although using sharp objects can damage the layers. This is in contrast to other types of touch sensors, such as capacitive sensors, which require the object making contact with the touch surface, such as a finger, to be conductive. Resistive touch sensors are generally durable and less expensive than other touch technologies; this contributes to their wide use in many applications. However, resistive touch sensors offer a lower visual clarity (transmitting about 75% of the display luminance) than other touch technologies. Resistive touch sensors also suffer from a high reflectivity with high ambient light conditions, and this can degrade the perceived contrast ratio of the displayed image. When a user touches the resistive touch sensor, the top layer of the sensor experiences a mechanical bouncing from the vibration of the pressure. This affects the decay time necessary for the system to reach a stable DC value to determine a position measurement. In addition, affecting the decay time is the parasitic capacitance between the top and bottom layers of the touch sensor, which affect the input of the ADC when the electrode drivers are active. Resistive touch sensors come in three flavors: 4, 5, and 8 wire interfaces. Four wire configurations offer the lowest cost, but they can require frequent recalibration. The four wire sensor arranges two electrode arrays at opposite sides of the substrate to establish a voltage gradient across the ITO coating. When the user presses the sensor surface, the two sets of electrodes can act together, by alternating the voltage signal between them, to produce a measurable voltage gradient across the substrate. The four wire configuration supports the construction of small and simple touch panels, but they are only rated to survive up to five million touches. Five wire configurations are more expensive and harder to calibrate, but they improve the sensor’s durability and calibration stability because they use electrodes on all four corners of the bottom layer of the sensor. The top layer acts as a voltage-measuring probe. The additional electrodes make triangulating the touch position more accurate, and this makes it more appropriate for larger, full size displays. Five wire configurations have a higher life span of 35 million touches or more. Eight wire configurations derive their design from four wire configurations. The additional four lines (two on each layer) report baseline voltages that enable the controller to correct for drift from ITO coating degradation or from additional electrical resistance the system experiences from harsh environmental conditions. The uses for 8 wire configurations are the same as 4 wire configurations except that 8 wire systems deliver more drift stability over the same period of time. Although the four additional lines stabilize the system against drift, they do not improve the durability or life expectancy of the sensor. If you would like to participate in this project, post here or email me at Embedded Insights. This entry was posted on Tuesday, June 8th, 2010 at 5:19 pm	and is filed under User Interfaces. You can follow any responses to this entry through the RSS 2.0 feed. You can skip to the end and leave a response. Pinging is currently not allowed. I worked in the semiconductor industry for many years. One of the companies I worked for tried selling a capacitive touch sensor into the automotive segment. There was a lot of interest, but an issue that we never got around was that it indeed was dependent upon the conductive qualities of the human body, and when it’s cold outside in winter, people wear gloves.